WOW, what an amazingly incredible show. 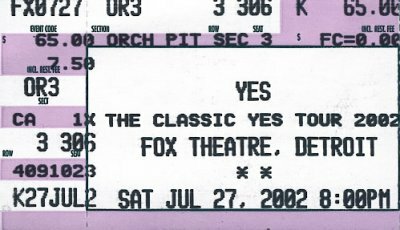 I have seen Yes many times, but have to say this rates as among the BEST I have seen. 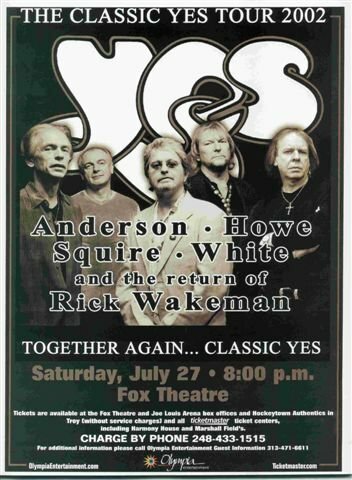 Rick Wakeman's solo was absolutely incredible, and what about Steve Howe? He is always impressive. Having seen him with Asia years back, I always knew the guy was a God on the guitar, and very under appreciated. Watching him on Saturday night made me appreciate him even more. The guy can rock with the best of them on the electric, and sit back and chill with the best of them on the acoustic. Jon's voice was flawless, he sounded absolutely perfect, AND the band absolutely gelled to the max, playing all the classic hits! Chris Squire looked to me to be among the BEST bass players I have seen in nearly 400 concerts in my time. He was the most incredible performer I have seen on the bass guitar, and did things with it I have never seen done on stage. What a master !! 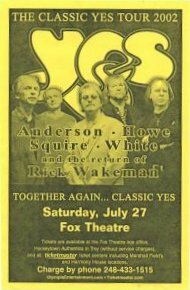 Seeing them in this awesome form, you can bet that you'll see Yes recording and hitting the touring circuit for YEARS to come.! And you know what? That's an AWESOME FEELING! No No Jon was not wearing a purple suit; he was wearing some tacky fluorescant green outfit. Regardless, the show was near perfect. The fans were going absolutely crazy after every song. In turn, the band came out and played every song with a crazy enthusiasm and driving excitement. They were happy, the fans were happy, the venue was probably the most magnificent i've ever been to. 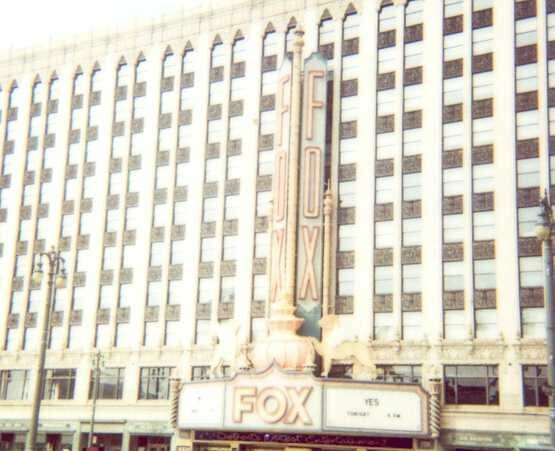 Fox theatre in Detroit- WOOOOOW! ANyways, to give an example of how in good spirits everyone was last night, the band actually played South Side of the Sky. I never knew they played that number in concert! The whole thing was just about flawless in every respect. They even had a beachball hit Rick Wakeman's keyboards while he was jamming on it. Anyways, I think the fans couldn't have given the band a better gift, and the band couldn't have given us a better performance. Thank you Yes. WOW!! A great show. 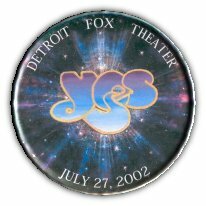 I have seen Yes 10 times since my first time in '95 at the age of 15 and this show at the Fox Theatre in downtown Detroit ranks right up at the top of my list. 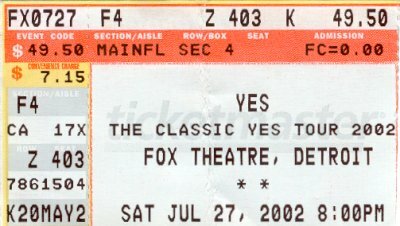 Yes was so tight and on last night. It was great to see Rick live for the first time, he played great, I really liked how he played the part of the Orchestra on ItPo and Magnification. Steve was the most animated I have ever seen him, and his playing was great, nobody plays the pedal steel like him, amazing. Alan was the best I have heard him ever. There was not any moment where I felt like he didn't have a grip on the song and the different parts. Chris was the man as usual. He was in extremly fine voice as well, his voice has gotten better and better over the last 5 years or so. His harmony vocals with Jon on DKtW and RSoG were perfect. Jon was also in very fine voice last night. The best he has sounded since '98. everyone looked great (with the exception of Jon who looked like he was wearing purple pajamas. ), loved Rick's long silver coat and Chris's long black one. Anyways, it was a great show. SSotS was unbelievable as was Awaken and RSoG. 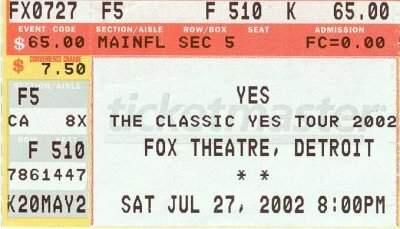 Thank you Yes for your endless inspiration and timeless music.